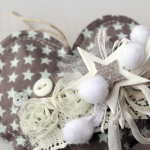 Add an interesting pattern or inscription on the homemade bracelet to make it a truly unique and interesting gift. 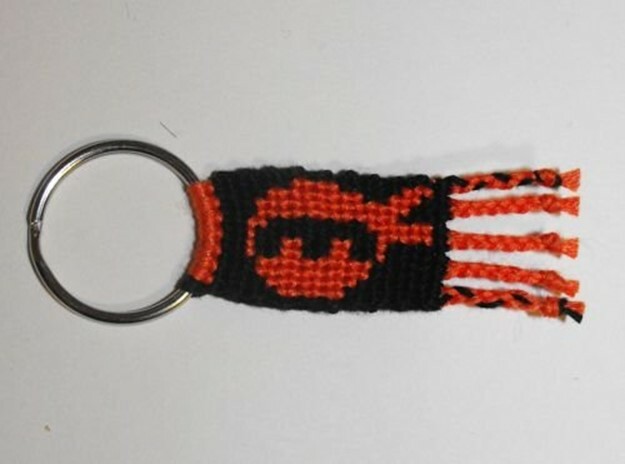 We offer you to take advantage of the simple principle of weaving bracelets, which enables you to quickly and easily make excellent accessories and exclusive keychains. Step 1. First, prepare the work surface. The book fit stripe jersey and securely fix it, you can use adhesive tape. Step 2. 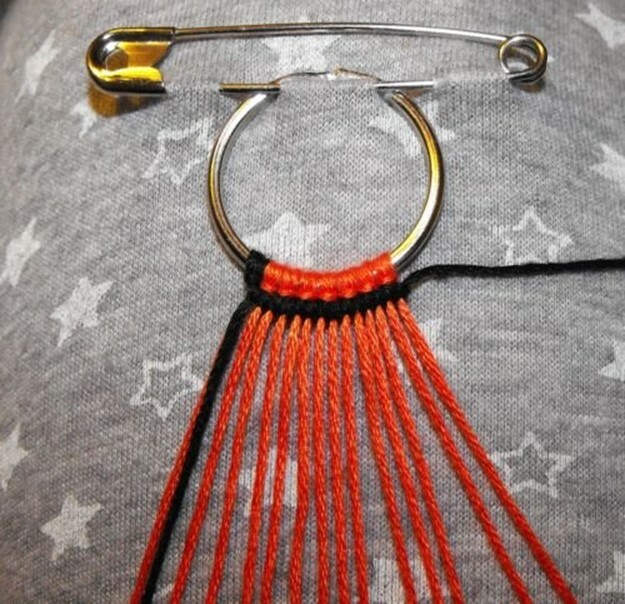 On a metal ring tie thread floss color, which will form the pattern. On the edge of the tie thread which will be the background. 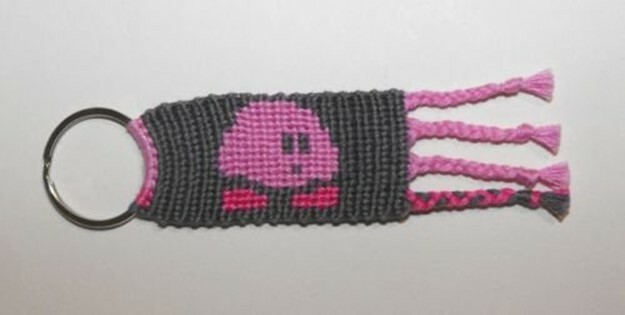 Background thread should be very long, depending on the width of the bracelet and wrist circumference may take up to 8 yd (approximately 8 m) of thread. Threads take as much as you need to create the pattern. 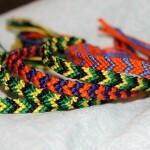 When you weave bracelet, tie knots on the ring, so that when the outbreak remained tail. 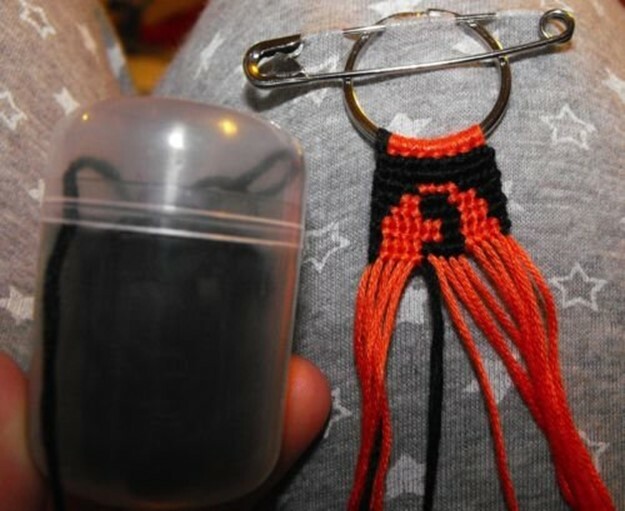 For weaving keychain, tie knots folding thread in half. In this case, we do not leave tails. Step 3. Sketch pattern scribble on paper. Cells paint, noting pencil background nodules, which will be located on the front side. Step 4. 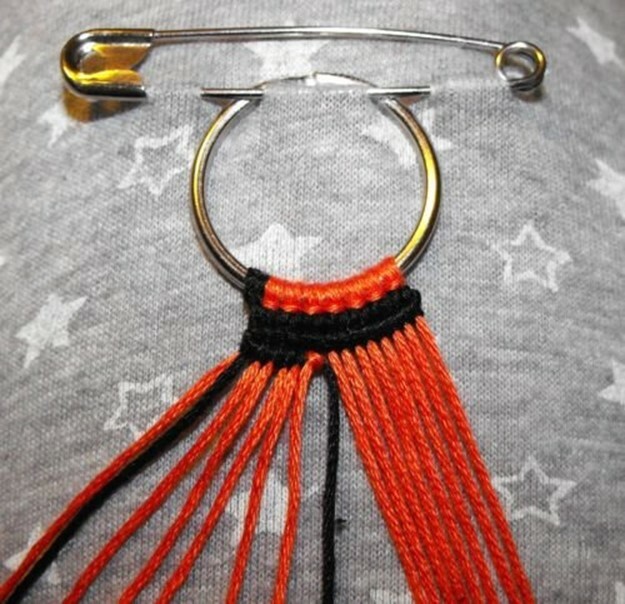 Pin fix the ring with the threads on the knitted fabric. 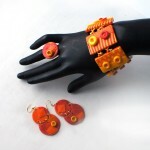 So you prefer to work, and the bracelet will be smooth and accurate. Long thread insert in a box of Kinder. The thread will not be confused. Step 5. 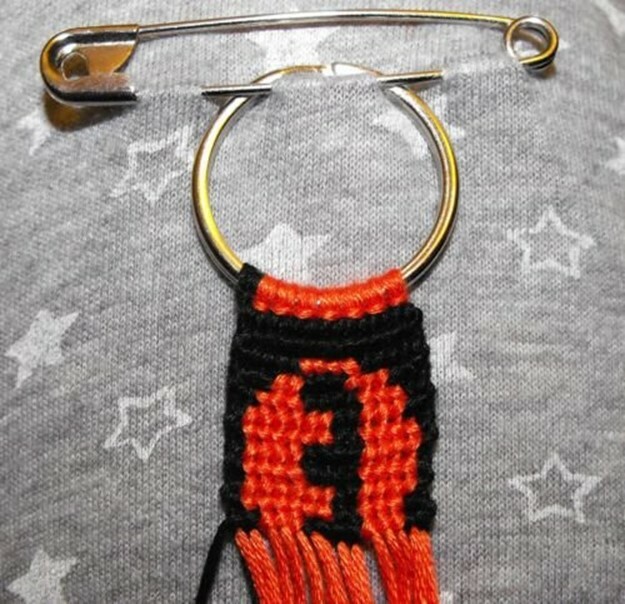 In this case, on the ring fixed 14 orange and 2 black threads. Black background thread is long. Start weaving on the part of the background thread. Step 6. 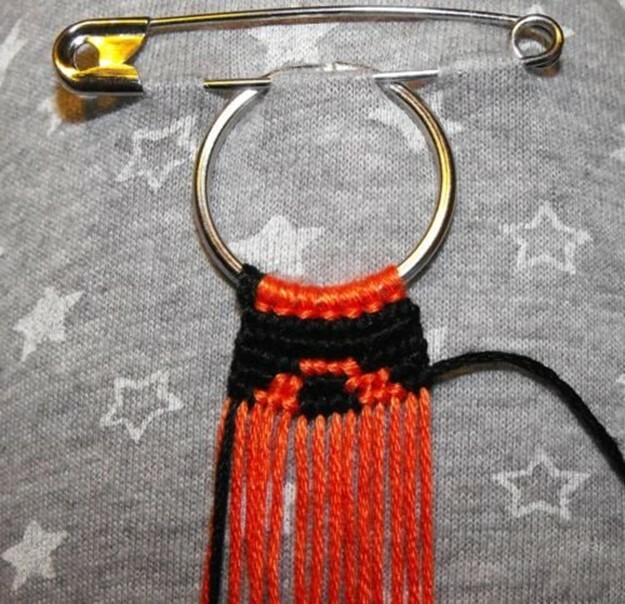 Take a black thread and start to knit knots as shown below. The second row whipping in the opposite direction. 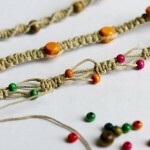 Continue to weave the threads to the end of the bracelet, leaving two loose threads. Thread pattern output when tying the knot forward. Step 7. at the end of the knitting splitit Strands in a braid and tie a neat knot. 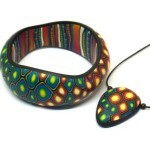 For bracelet tie threads on both sides, so it does not crumble. 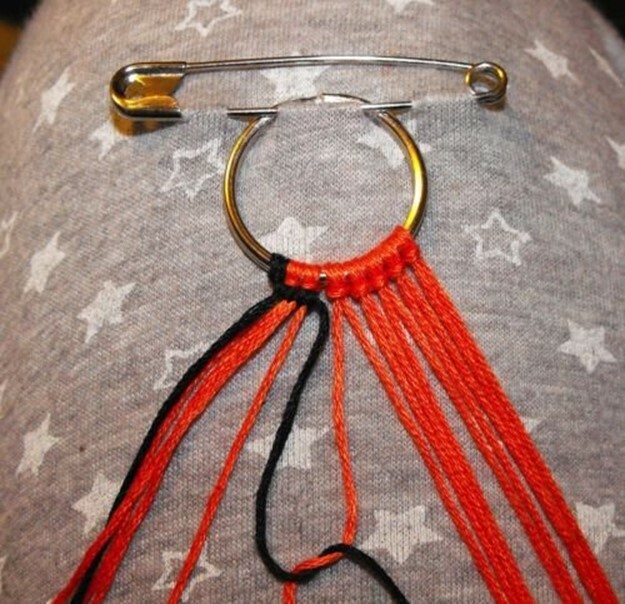 You homemade bracelet (or keychain) is ready! can you teach the cat one?